To check whether Inspectlet is installed and functioning correctly, append ?inspectlet_diagnostics=true to your website URL to bring up the diagnostics console. 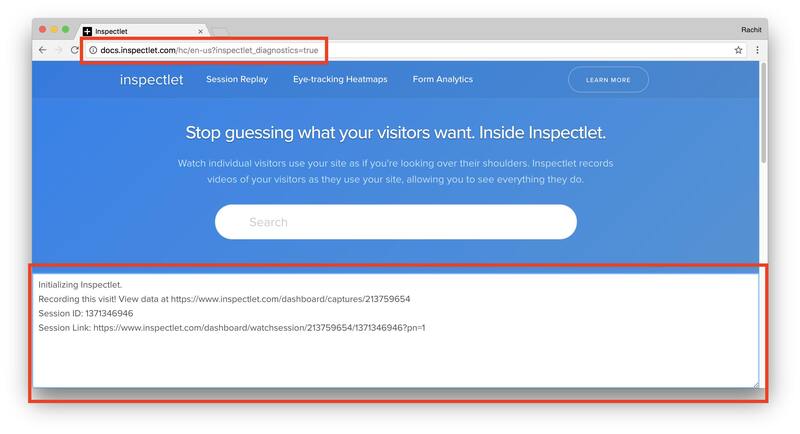 For example if Inspectlet is installed at URL https://example.com/example.html then point your browser to https://example.com/example.html/?inspectlet_diagnostics=true to enable diagnostics. In diagnostics mode, Inspectlet adds a console to the bottom of the page and outputs informational messages about what's going on under the hood. The console gives you information about which website (wid) Inspectlet is storing the data for this visit in, a link to view your session recordings for this website, a session ID, and a direct link to the session recording for your own visit. To trigger detection as a new visitor or try a fresh session, please delete your cookies or open the URL in incognito mode.